LOS ANGELES, Jan. 5, 2017 /PRNewswire/ -- Baidu, China's leading search engine, and Ainemo Inc., China's top technology driven consumer electronic company, jointly unveiled "Little Fish" (Chinese name: Xiaoyu Zaijia), a voice-controlled family robot powered by Baidu's AI at Digital Experience! and CES 2017. With the partnership of these two industry leaders, "Little Fish" is positioned to become one of the top home assistants in the world. "Little Fish" is powered by DuerOS, Baidu's AI assistant platform. It takes the user experience to the next level with the addition of a screen that can show visual aids for more engaging user interactions and assistance. Users may interact with "Little Fish" through voice conversations to enjoy music, explore news, get answers, request on-demand services, manage calendars, control home appliances, make video calls and more. Unlike other AI assistants, "Little Fish" (Xiaoyu Zaijia) features a large screen, which opens up the ability to video chat and stream visual content directly from the device. Baidu DuerOS is the conversational AI OS for everyone and everywhere. It is the gateway to Baidu's extensive Internet ecosystem through the most natural user interface - voice. This ecosystem includes Baidu's massive local services platform where tens of millions of people buy movie tickets, order takeout food, request cleaning services and more. The platform will not only allow users to easily get information but also to get access to a variety of on demand services (known in China as O2O or online to offline). "Together with Ainemo Inc., we were able to combine the best hardware with state of the art AI technologies to deliver an advanced and easier user experience," said Kun Jing, Chairman of Baidu A.I. Product Committee, GM of Baidu DuerOS. "We believe family robots will be the next big category that will be a member of everybody's home, but it has to be useful and reliable, helping to solve real problems in people's lives," said Chenfeng Song, founder and CEO of Ainemo Inc. "Chinese families, especially with kids and seniors, still have difficulty using today's new technologies. They will now have the opportunity to connect with family members and manage their everyday life by simply talking to a robot. This is the ultimate A.I. virtual assistant, offering users a level of control and communication like never before." "A.I. is a valuable new tool that will surely change many industries and become the next trillion-dollar market," said Dr. Kai-Fu Lee, founder & CEO of Sinovation Ventures. "With this smart device, people at home can free up their hands and have reliable assistance in a few key things like making phone calls and playing music, searching for information, etc. The assistant gets smarter over time by adding new skills and learning about the family's behaviors." Featuring an "A.I. Brain," "Little Fish" not only assists, but also learns. The innovative device expands its knowledge regularly, becoming smarter and more efficient day by day. Whether it is ordering takeout, purchasing movie tickets, or connecting with family, friends, or colleagues who are away from each other, "Little Fish" offers a caliber of assistance like never before. For more information and a first look at "Little Fish" (Xiaoyu Zaijia), please visit www.zaijia.com. Executives from Baidu and the Founder & CEO of Ainemo Inc. are available to media for interviews Jan. 4-6. Founded in 2014 in Beijing, Ainemo Inc. is a technology driven consumer electronic company. We make useful home robots powered by A.I. Ainemo has completed Series A, B and B+ rounds of investments over 30 million US dollars from Sinovation Ventures (formerly known as Innovation Works), Chengwei Capital, Lightspeed China Partner and Foxconn. Ainemo's flagship product "Little Fish" (Chinese name: Xiaoyu Zaijia) is an intelligent voice-controlled family robot that facilitates communication inside and outside home. Users may interact with "Little Fish" through voice conversations to make video calls, leave messages, control home appliances, play music and news, seek information, ask for O2O (Online to Offline) services, interact with chatbots and more. In a little over a year, "Little Fish" has grown its user base in more than 35 countries and over 550 cities. 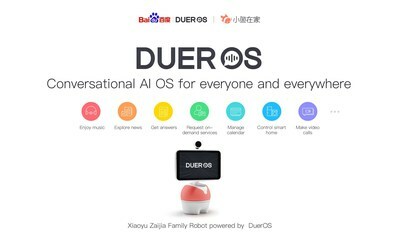 DuerOS is a conversational AI OS for everyone and everywhere, built by Chinese search giant Baidu. DuerOS is an artificial intelligence OS that sets itself apart from traditional OS by allowing the user to interact mainly through voice conversations and it's A.I. Brain in cloud, which improves daily. A.I. 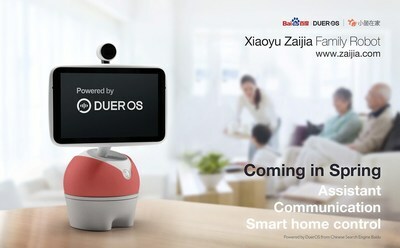 is the new electricity, and DuerOS is Baidu's A.I. implementation. For any DuerOS powered devices, users can interact with them through voice conversations. People can enjoy music, explore news, get answers, request on-demand services, manage calendar, control home appliance, , and use other intelligent personal assistant features simply through voice conversations. DuerOS can be run on phones, smart speakers, robots, televisions, cars, wearables, and many other devices.